I was against the idea of buying one at first. I told hubby that installing a water heater can just add up to our monthly electric bill. We cannot afford another appliance that consumes electricity. It’s not just practical for us or so I thought. 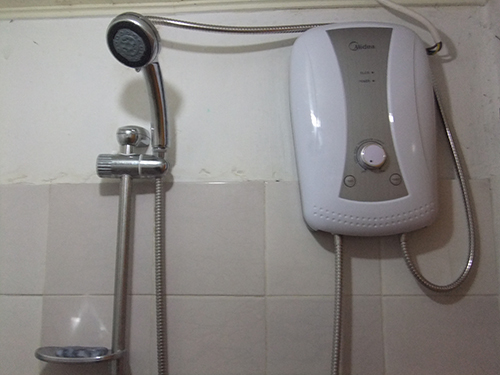 But the always persistent hubby explained the benefits of having an instant electric water heater at home. First, the kids are used to taking a bath with warm water in the morning. Second, it will prevent a possible accident. For many years we have been using the decade-old stainless bottle sterilizer to boil/warm their bath water. Transferring the sterilizer with hot water from the kitchen to the bathroom is dangerous for someone holding the sterilizer even if they have aluminum crank handles. We fear of getting scalded or burned by the hot water. We don’t want an accident to happen, so I have to agree with hubby’s plan to buy this electric water heater. We’ve been using the instant water heater for over a month now and so far it doesn’t consume that much electricity. We are paying the same amount since we purchased it. We bought the water heater at a discounted price and it comes with a free soap dish. This entry was posted in Appliance, Best deal and tagged instant electric water heater, water heater on July 16, 2013 by Mommy Yam.